In a new study, researchers from Indian Institute of Science (IISc), Bangalore and Indian Institute of Science Education and Research (IISER), Pune have shown how bacteria take help of Hydrogen sulphide (H2S) gas to defend themselves against the onslaught of antibiotics. The study was published in Chemical Science. Antibiotics usually kill bacteria by inducing oxidative stress leading to accumulation of reactive oxygen species (ROS), that damage bacteria’s essential machinery -DNA and enzymes. 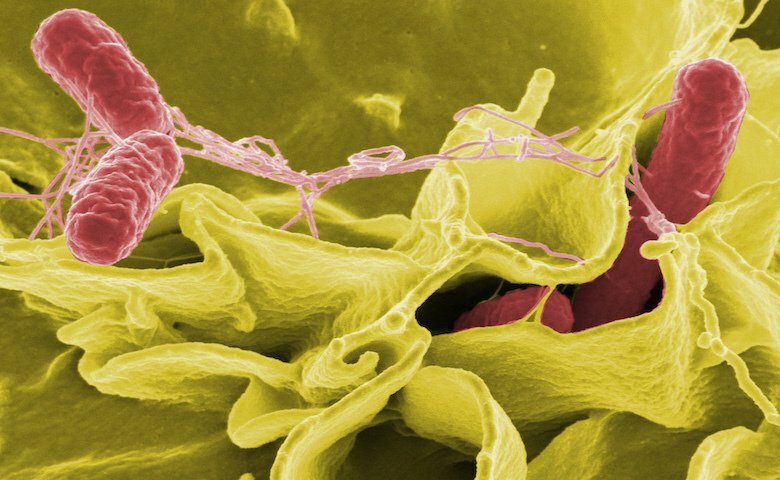 Interestingly, when antibiotic-resistant bacteria encounter such oxygen-rich environment, they produce H2S that scavenges the excess ROS and protects the cell from damage. To be able to study how H2S affects resistant bacterial cells, the team devised an innovative system for generating H2S inside living bacterial cells. They designed a new compound, cyclopentane-1,1-diylbis((4-nitrobenzyl) sulfane, “which is a substrate for E. coli’s nitroreductase enzyme (NTR) and releases H2S in presence of the enzyme inside the cell” explains Prashant Shukla, PhD student at IISc, Bangalore, and one of the authors of this study. The NTR enzyme is expressed exclusively in bacteria and not in mammalian cells. “We wanted to exclude possibilities of host-derived H2S playing a role in our experiments with intracellular pathogens such as Salmonella and Mycobacterium.” says Harinath Chakrapani, Associate Professor, at IISER, Pune and an author on the paper. The designed donor was able to permeate inside healthy bacterial cells while retaining their functionality. When donor loaded bacterial cells were exposed to hydrogen peroxide (H2O2), which is a good source of ROS, the H2S released by donor present inside the bacterial cells was able to reduce it and protect the cell from damage. The authors also examined if elevated endogenous H2S levels showed a positive correlation with drug resistance in human infections. “We measured the intracellular H2S levels of several multidrug-resistant (MDR) E. coli strains isolated from patients suffering from urinary tract infections (UTI). The endogenous H2S levels were considerably higher than non-pathogenic strains (of bacteria) indicating a possible functional role for H2S in antibiotic resistance”, says Shukla. The authors were also able to show that inhibition of H2S biosynthesis reversed antibiotic resistance in MDR varieties of UTI-causing bacteria. UTI affects millions in India and indiscriminate use of antibiotics has made UTI pathogens resistant to most antibiotics. Amit Singh, Assistant Professor at IISc and one of the authors of the study says “A combination of molecules/drugs targeting H2S biosynthesis, antioxidants, and an alternate route of respiration could have a remarkable impact on reversing drug resistance and clinical outcomes”.